The Vergnano family drew from deep within the annals of distillation history for the inspiration for their Malfy Gin. About one thousand years ago (yes, really) monks in Italy were experimenting with primitive distilling techniques and the bounty of the Italian countryside. It’s extremely likely that at some point, owing to the fact that juniper grows widely throughout Italy, that monks experimented with juniper and therefore, drank one of the world’s first distilled juniper berry drinks. But I digress. The Vergnano family’s gin is naturally distilled in a modern fashion, but similarly builds on the bounty of the Italian land: the base is Italian wheat, the juniper is from Tuscany, and the lemons are a blend of Sicilian and boutique Amalfi Coast lemons. These lemons are highly protected and there’s actually a lemon tourism industry around them. Limited in production to only 25 tons of lemons/hectare, they’re renowned for their potent aromatic quality, boasting more oil glands than other varieties. Though most of the lemons go to limoncello, Malfy Gin is lucky enough to include them in their botanical bill along with grapefruit and orange. The nose is rich, with citrus oil notes: lots and lots of lemon, with some bitter orange rind notes underneath it, lending it an almost Chinotto under-note. Deeper, there’s a faint terpenic conifer note under it as well. The palate is absolutely bursting with incredible lemon flavor. Whatever they’re doing with the lemon zest, it’s evident that they’ve preserved a great deal of the character. I can most readily compare it to that note you get on a cocktail when you take a whiff of a well-squeeze lemon zest. On the early palate, you get some coriander and juniper, hints of licorice, with faint hints of fennel, ushering in a citrus dominated finish that has some piney low notes, and traditional gin spice. The palate can be easily summarized as such: It’s lemon. But what I really appreciate about it is that there are some nice traditional touches around the edges that give it a roundness, and distinctively gin-like complexity. It’s not just a limoncello without the sugar. It’s a very, very, citrus forward gin. I’m going to admit this might be a matter of taste here. I shared this with friends and found them to be somewhat divided. While I absolutely loved it, others thought it was a bit too single-minded. I think what really stood out to me about it was that it, to me, tasted like real lemon zest. It had all of the fantastic character of an excellent limoncello, without any of the sweetening. When I think about where contemporary gins can go, this is what excites me about covering new gin, day in, day out. It’s clear that it came out of the gin tradition, and the requisite notes are here, but the focus to getting that one contemporary note right, and so right, clearly stands out here. There’s nothing else out there like this. 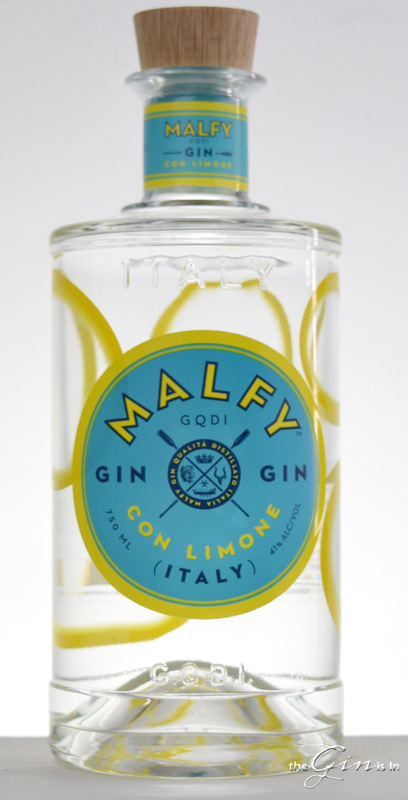 If you’ve been drinking citrus forward gins like Bluecoat or New Amsterdam, you owe it to yourself to try Malfy Gin. Fans of contemporary style, citrus forward gins, meet your new best (gin) friend. While I think fans of classic styles might find the focus too narrow or there to be not enough juniper, I think the attention to detail and elevating one fairly traditional gin botanical to these sort of heights deserves some merit. I’ll be sipping this Gin and Tonic all summer if I can. Highly Recommended. There is an ”original” version of this gin without the lemon. Have you tried it? If you like the gin as such maybe this version will come off less single-minded among your friends.